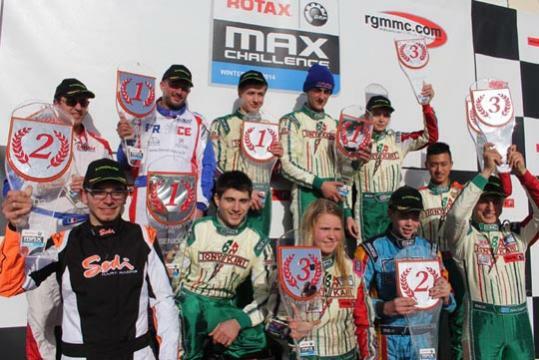 Campillos (ES) witnessed en exciting final day of the fifth ROTAX Winter Cup. While the track was a little bit wet in the morning, it dried up just in time for the prefinal races. Even the sun showed up providing best conditions to the 34 finalists of each category. In the very end Sean Babington (DD2), Guillaume Berteaux (DD2 Masters), Yuri Vips (juniors) and Joseph Reilly (seniors) took deserved victories. DD2 Pole sitter Sean Babington (Strawberry Racing) left no doubt in the prefinal. He did a perfect start boosting himself far ahead of his chasers. That was already half the battle for the Tonykart driver. From there on he easily controlled his lead up to the finish line. Behind the winner, Oriol Dalmau Caballero (Motor Club Deportivo Creixell was in second position for a few laps until he had to give way to Xen de Ruwe (ART Grand Prix) who saw the chequered flag in second position. As for the DD2 Masters Mikko Laine (DM Racing) could not confirm his excellent performance from the heats. He dropped back a lot of positions. On the other hand his opponent Florent Lambert (Tatum Racing) did a brilliant job. He was best of the Masters drivers and secured tenth place in the overall grid. At the start of the final Babington defended his lead again, equally profiting by a slight collision involving Xen de Ruwe, who lost a lot of positions subsequently. So Oriol Dalmau Caballero seemed to be Babington’s hardest rival, but the local hero had to retire from the race soon after. That was when Anthony Abbasse (Sodikart) came in. After being disqualified in the qualifying practice he caught up during the heats, took place four in prefinal and finally asserted himself in second place in the final. Yet the Frenchman was not able to challenge Babington seriously. In the end Babington celebrated a perfect and dominant weekend ahead of Abbasse and Andreas Backman (Strawberry Racing) from Sweden. In the Masters category prefinal winner Florent Lambert did a remarkable job again by finishing twelfth. Nevertheless Guillaume Berteaux (Kartagene) was slightly faster. Finishing only one position ahead of Lambert, Berteaux took the decisive final win. Junior pole sitter Richard Verschoor (Team TKP) was the man setting the pace in the prefinal. He defended his lead while his hardest opponents Thomas Preining (Team TKP) and Juri Vips (Strawberry Racing) dropped back a few positions. Yet Verschoor had no walkthrough. Dave Wooder (Dan Holland Racing) and Max Timmermans (Dan Holland Racing) followed in the leader’s slipstream. To the end of the race the fight became more heated: Wooder took the lead but Verschoor came up with a counterstrike. That made the following drivers catch up quickly, turning the leading group into a sextet for the final lap. In the end Verschoor kept his nerve and took the win ahead of Timmermans who was able to overtake Wooder on the last metres. The junior’s final quickly developed into a fight between Richard Verschoor, Dave Wooder, Juri Vips and Darren Keane (Strawberry Racing). Preining especially pushed very hard making his way through the pack. When the race approached the end the Austrian even captured the lead but his rivals did not give up at all. Verschoor tried to seize his chance in the last passages before the finish line while Preining did not give in. Both of them lost so much speed that it was Vips in third place who came up with a surprising manoeuvre and overtook the leading duo. By this last minute attack Vips took the final win. Verschoor still managed second place while Preining had to leave the third podium position to US driver Keane. With a massive crash the seniors opened their prefinal. Most prominent victims of the larger pile-up were Philip Hamprecht Hamprecht (Strawberry Racing) and Michael Cool (Bouvin Power) who shared the second starting row. On the top Joseph Reilly (Strawberry Racing) and his teammate Guan Yu Zhou stayed untouched by the action and concentrated on their leading roles. But they were put under pressure by Aavo Talvar (Talvar Racing) and Connor Jupp. When it came to the final spurt positions began to change and especially Zhou proved to be tough. After taking the lead the former junior stood his ground until the finish line. Joseph Reilly took second position in front of Connor Jupp. Aavo Talvar had to give way to Jessica Backman (Strawberry Racing) who gave an impressive debut in the senior class. The senior’s final went off without a hitch and was quite unspectacular at the front. Zhou established himself in first position while Reilly followed in his slipstream. The leading duo soon had a comfortable gap to the rest of the grid and kept a sort of ceasefire until the end of the race. Two laps before the flag Reilly overtook Zhou successfully and did not leave his teammate any more chances for a counterstrike. Reilly saw the chequered flag closely ahead of Zhou. In third place Jessica Backman drove a solid and impressive race. A few seconds behind the leaders she completed a triple success for Strawberry Racing and was rewarded best international result ever.